With the wild primary season and uneventful party conventions behind us, the general election campaign is under way for the U.S presidency. A year ago at this time, the Republican nominee, Donald J. Trump, was not even an announced candidate. For most Democrats, however, former secretary of state (and former first lady) Hillary Rodham Clinton had been “penciled in” as the party’s presumptive candidate since 2008, after she lost the nomination to Barack Obama. The biggest surprise of the Democratic primaries was the strength of the challenge to Clinton from 73-year-old Vermont senator Bernie Sanders, an independent who caucused with the Democratic Party. Sanders, who calls himself a democratic-socialist, attracted a loyal following, including many young people, to his insurgent campaign. Clinton eventually won more delegates and captured the nomination on July 26. In doing so, she became the first woman candidate of a major party in a U.S. presidential election. Clinton selected Tim Kaine, a U.S. senator from Virginia, as her vice presidential running mate. Trump beat out a field of 16 candidates for the Republican nomination, securing the nomination by winning 36 states’ primaries. The billionaire real-estate “mogul” and reality-TV star attracted strong support among primary voters, as experienced politicians, including former and sitting governors and senators—Jeb Bush, Chris Christie, John Kasich, Rand Paul, Rick Perry, Marco Rubio, and Scott Walker, among others—fell by the wayside. Senator Ted Cruz of Texas, Trump’s closest rival for the nomination, won 11 states. Governor John Kasich of Ohio, who won only the primary in his home state, kept campaigning long after it was clear he could not win the nomination. Trump picked Indiana governor Mike Pence to fill the Republican ticket. 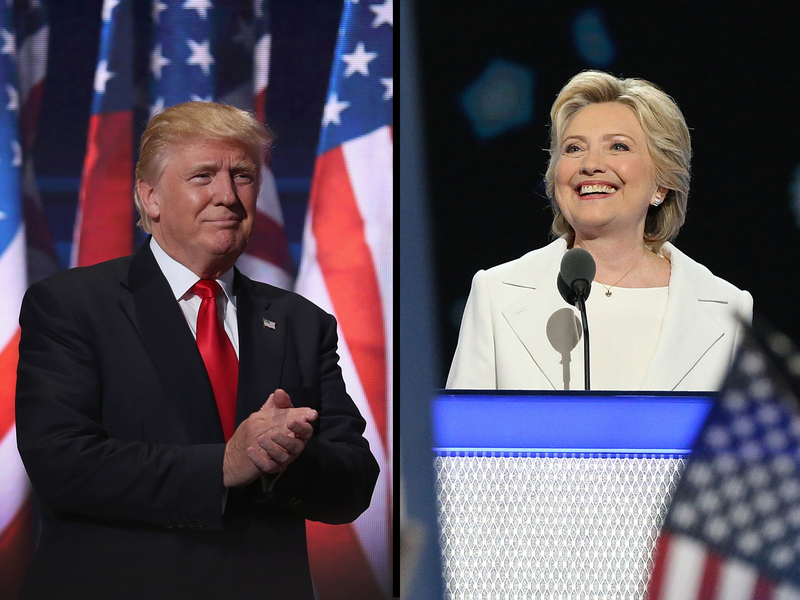 Prior to the conventions, a measure of voters’ satisfaction with the choice of candidates in 2016 was the lowest it has been in 20 years, according to findings by the Pew Research Center. Many voters are as much against the other candidate as for their own. As of mid-August, polls are generally showing Clinton with a sizable lead. The Republican Party is perhaps more fractured than ever before, as many conservatives continue to oppose Trump’s candidacy. Several third-party candidates are also in the race: Libertarian Gary Johnson and Jill Stein for the Green Party. Examine comprehensive polling data from all angles on issues and candidates. Contrast and compare the candidates’ positions on issues. The latest polling data at your fingertips. Includes links for the primary results, the latest polls, and more. Follow the money: see who has raised the most campaign cash, from whom. Visit this nonpartisan website to answer questions to see which 2016 presidential candidate you most agree with. This page allows you to “vote” on numerous issues in categories including social, immigration, economic, foreign policy, and more.